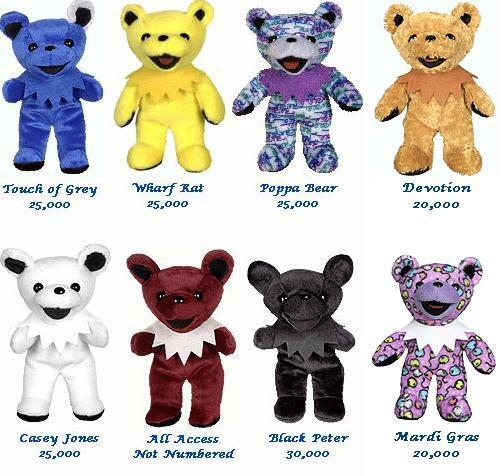 The Limited Edition Grateful Dead Bean Bears are in stock unless noted otherwise. Poppa Bear, otherwise know as the Signature Bear is the colors used in the Liquid Blue Logo. Paul Roidoulis, President of Liquid Blue has signed his name within the pattern. All Access - On Oct. 21, 1999 All Access was released to dealers only as a combo with a Jerry Doll. No more bears were to be produced then there were Jerry Dolls still in Liquid Blue's stock. The Jerry Doll is limited to 100,000 and was released in Nov. of 1998. The All Access Back Stage Pass is not numbered. Production of this bear is 52,800. This is a photo of the Liquid Blue Bear. There were only 160 of these produced, one for each employee. They were distributed to the employees in mid June, 2000. The bear came with a numbered certificate. 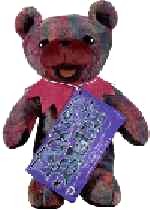 For 5 or more bears shipping is FREE in the U.S.
We accept Money Orders, Checks or payments through PayPal.